Our company is a prominent manufacturer, exporter and supplier of high quality range of Stainless Steel Klin Anchors. These products are developed using the finest quality raw material procured from some of the most trustworthy and certified vendors of the industry. 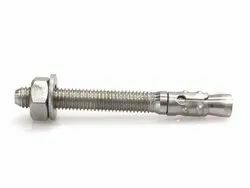 We offer a comprehensive range of Stainless Steel Klin Anchors for use in assortment of purposes. The wide range of SS plow anchor manufactured by us encompasses zigzag shaped anchor, SS UV anchor, Y-type SS anchor, SS Y-type twisted flat anchor and L-type SS anchor. We are one of the renowned stainless steel anchor manufacturers and suppliers in India. Customers sprawling across the globe can avail from us the sustainable range of SS Anchor. We are affianced in presenting to the industry a top class range of SS Flat Klin Anchor. - Stainless Steel: AISI 304 / 304L/ 304H/ 316/ 316L / 317 / 317L / 321 / 310 / 347 / 904L / 2205 / 2507 / UNS 31803 / UNS 32750 etc. - Types: V, Y and Zigzag. We can provide any types of Anchor as per your drawings / requirement. - Size: As per your drawings/ requirement.